In the Word of God nothing is clearer than the longsuffering of God which seeks and waits for individuals to repent of their sins before His holiness requires judgment for those sins. He rises to judgment only when iniquity is full. Pray daily that many sinners will find cleansing through the blood of Jesus Christ. Intercede earnestly for unsaved individuals that they will come to God by the “new and living way” (Hebrews 10:20). Pray for the SMS missionaries that they would rise to any occasion to proclaim the Good News “that Christ Jesus came into the world to save sinners” (1 Timothy 1:15). The SMS missionaries of Western Ukraine always try to gather together for a time of sweet fellowship with Rob Zapotoski, SMS interim director, when he visits the Lvov and Volyn regions each year. The time of fellowship consists of reminiscing and reflecting on past Christian ministries in Western Ukraine followed by a time of reporting about the future prospects of ministry in both regions, as well as other places such as Kazakhstan and Uzbekistan. Each missionary shares his current ministry in detail and then requests prayer for future opportunities or needs. The SMS interim director marvels at the manifold ways that God works through these dedicated servants to accomplish great feats of faith. Still, there are possibilities for future outreach projects and new ventures of evangelism. For this reason, Slavic Missionary Service seeks to continue to support these men for “the sake of the Gospel” (1 Corinthians 9:23). 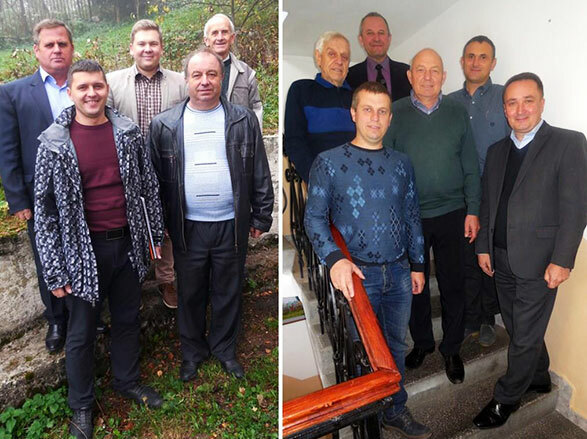 These missionaries of Western Ukraine are extremely grateful to God for the many individuals, families and churches that have assisted them in their labor for the Lord. Without this collaboration, it would be impossible to accomplish such spiritual ministries with so much progress. Therefore, a heartfelt “thank you” is extended to all supporters who are assisting in “the partnership of the Gospel” (Philippians 1:5). There is no one like you, and there is no God but you. Pray that the Gospel will reach the millions in the Slavic countries that have not yet heard what Christ has done for them. Many small cities and towns still do not have an official place of worship. Ask God to help the Slavic churches be effective witnesses in their neighborhoods. Pray that souls will continue to be saved, baptized and discipled through the ministries of the church. Pray that the Holy Spirit powerfully and persistently will convict men of sin and lead many to believe that Jesus Christ is the Savior of the world.